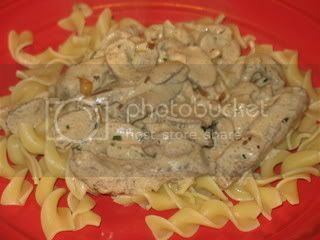 There are not many foods that I hate, but I absolutely loathe beef stroganoff--or at least I used to--even though I've never actually eaten it. You see, when I was a kid my mom once made beef stroganoff. This was during my smell-every-bite-of-food phase, and I just couldn't get over how it smelled. I thought it smelled like puke and refused to eat it. My dad got angry and sent me to my room without dinner. Ever since then, I've avoided the stroganoff. I don't know what my mom made that day. I am guessing it was Hamburger Helper, because real beef stroganoff sounds pretty tasty...browned steak with sauteed onions & mushrooms all in a creamy sour cream sauce poured over egg noodles. How can that be bad? A few months ago I decided to try beef stroganoff for the first time. I had planned to order it at Gentelin's, the nicest restaurant in town. However, once I got there I noticed they had taken the stroganoff off the menu. So, it was going to be up to me to make it. 1 pound of top sirloin or tenderloin, cut thin into 1-inch wide by 2 1/2-inch long strips. 1/3 cup shallots or onions, chopped. 1/2 pound cremini mushrooms, sliced. 2 teaspoons fresh tarragon, chopped. 1 cup sour cream, room temperature. Melt half of the butter in a large skillet on medium heat. Increase the heat to high/med-high and add the strips of beef. You want to cook the beef quickly, browning on each side, so the temp needs to be high enough to brown the beef, but not so high as to burn the butter. You may need to work in batches. While cooking the beef, sprinkle with some salt and pepper. 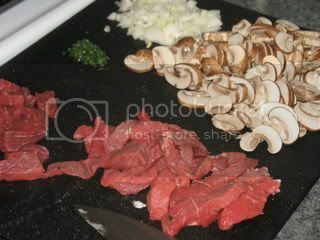 When both sides are browned, remove the beef to a bowl and set aside. In the same pan, melt the rest of the butter. Increase heat to medium high and add the mushrooms. Cook, stirring occasionally for about 4 minutes. While cooking, sprinkle the nutmeg and the tarragon on the mushrooms. Reduce the heat to low and add the sour cream to the mushrooms. You may want to add a tablespoon or two of water to thin the sauce (or not). Mix in the sour cream thoroughly. Do not let it come to a simmer or boil or the sour cream will curdle. Stir in the beef and shallots. Add salt and pepper to taste. Serve immediately over egg noodles. Ok, so, beef stroganoff does not smell or taste like puke (though, it still kind of looks like it!). It tastes like sour cream. The beef was tender and the sauce was rich. It was okay, but not something that I'd make again (If I did make this again, I'd add more than just sour cream to the sauce...maybe some beef broth & white wine). Though, my dinner guests seemed to like it...they cleaned their plates and there were no leftovers! I didn't eat Beef Stroganoff unitl I married my husband. It's one of his mom's specialties. I have come to enjoy it very much. It's uber rich...but delicious. mmmmmm.